To start off this Ear of Corn Halloween costume, I found an adult sized green sweatshirt along with an adult sized green turtle neck. The bigger size gave the length and extra room my 5 year old needed. I then cut the sleeves off of the sweatshirt and set them aside to use for the hat. I then gathered numerous eggs cartons and spray painted them yellow and let dry. I then cut those into realistic shapes and hot glued them to the front of the sweatshirt. I bought green pieces of felt which I cut and pulled on to shape them then arranged those using hot glue around the egg cartons. I used the sleeve I had cut off the sweatshirt to make a hat. I cut a small hole in the top and threaded raffia through it to make the tassel. I hot glued the raffia inside of the hat then covered it so it wouldn’t hurt his head. 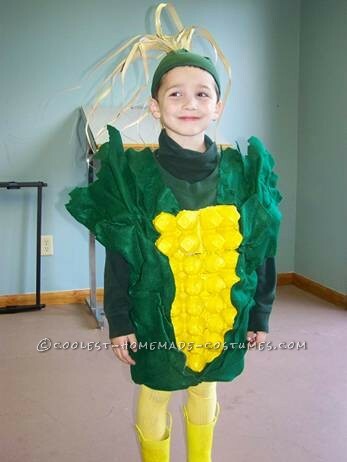 I put the green turtle neck on my son then put the sweatshirt with the corn right over the top. Throw on a yellow pair of tights and boots to complete the costume. The whole costume cost me $15.00 and a few burned fingers from the hot glue!